This sturdy walimex pro universal system flash holder makes your system and compact flash suitable for accessories. Studio equipment such as beauty dishes, softboxes, spot fixtures, reflectors, and much more, can be used with this universal holder, opening up a whole range of new options to you. 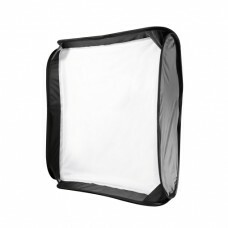 For strobe fans too, it makes an ideal solution for using your system flashes with studio accessories off location. A translucent or reflex umbrella can be assembled to the special umbrella mount and secured. Thanks to the rubberised pad, and the well-designed fixation, the system flash housing can be protected on both sides, and yet will stay securely in place. The angle of the system flash holder can be adjusted in stages; and the large, grippy clamp lever has a ratchet function. With the side quick-release lever, studio accessories can be quickly mounted with a walimex pro mount or Bowens mount or changed. The walimex pro universal system flash holder can be mounted on tripod using the spigot connector.